In early 1990s a disease, quick wilt affected the pepper plants, which was wide spreading and caused by a fungus called phytophthora. This entered into the plant through the cuts occurred on the roots while removing the soil for application of chemical fertilizers. The soil erosion was also severe in Idukki district mainly because the topsoil was washed off in rains. Due to tilling of land on the slopes used for pepper cultivation the top soil was washed out into the dams, reservoirs and rivers. This led to loss of fertility and adding more quantities of chemical fertilizers. The yield from pepper was going down sharply and the cost of cultivation was on a rise due to these factors. Soil erosion Incidents and the large number of deaths of aquatic animals in the lakes in Alleppey district also was reported during the same period. The studies reported the cause as contamination by chemical pesticides applied on crops like tea and spices up in Idukki district. Also there were incidents like tea plantation workers fainting after drinking water from the tea plantations the reason of which was reported as pesticide residues. This being the situation the small farmers were finding it very difficult to make both end meet. Those who had a proper title deed for their land started taking loans from commercial banks and co-operative banks while others took loans from private financial institutions. Many farmers became casual agricultural workers. PDS being the prominent NGO in the area started receiving calls for help from various villages. Fr. Mathew Arackal, the Executive Director then, (Presently Bishop of Kanjiralppally Diocese), wanted to find a solution for this. Thus, a National Consultation to study the reasons of these calamities was conducted in 1995. Senior scientists from Department of Science and Technology, Experts from major NGOs in India and farmer representatives were invited. After the three days presentations, deliberations and exposure visits to various areas in the district it was concluded that PDS should motivate farmers to go in for organic agriculture, controlled weeding, livestock farming, and adoption of suitable soil and water conservation measures etc. To help the farmers overcome the above mentioned problems, PDS decided to start a project on organic farming. For this, 20 villages were selected with 50 farmers from each village. In each of these villages a demonstration farm was developed where all possible organic farming practices were adopted. The farmers under the project were trained on the basic concepts of organic farming and organic practices. They were assisted in preparing vermicomposting, digging of manure pits, planting of nitrogen fixing plants, weed management etc. The impact of the project was that more than 500 farmers gained confidence in organic farming and adopted this. Realizing the need for an integrated approach on soil and water conservation for revitalizing the farming areas, PDS implemented the watershed management programme as a pilot project. Activities like construction of check dams, gully plugging, stone terracing, soil bunding, protection of streams, construction of ponds and water tanks, spring development, agro-forestry etc were done. Organic farming was given emphasis in the watershed area. This programme was very much appreciated and the government of India appointed PDS as the nodal agency to impart training to NGOs and government officials in South India. There after PDS implemented many watershed development projects in different parts of Idukki district. Establishment of Sahyadri Research Institute of organic Agriculture With the increase in the number of organic farmers PDS started a research wing on organic agriculture. Prof. Mathew P. John, former head of Chemistry Department in Christ College, Irinjalakuda was brought in as the department head. A soil testing laboratory was established, model vermiculture unit. The trainings on organic farming are conducted here using the demonstration units. Though PDS promoted organic farming in Idukki district as a solution to the problems faced by the farmers and prevent environmentally hazardous practices, the scope for obtaining a better price for the organic products of the farmers was realized on the way. To market these produces as organic, required certification. For this the then “Skal”, an agency based in The Netherlands was approached and they send their inspector from Srilanka. Accordingly our farmers got certified organic in 1998. The Organic Agri – Products division started in the year 1997. The first export of organic black pepper was done in 1998 after processing the same at an outside facility, situated in Cochin Special Economic Zone. Ever since the processing of organic spices till 2005 was done here. White pepper: The purchase of black pepper after paying a premium was a blessing to the farmers. In addition to this the farmers were trained in the processing of white pepper on a commercial basis, which was a value addition. Till then the house wives made white pepper for their house hold uses. But not on a commercial scale as it there wasn’t a good market for that. Through a series of training and frequent farm visits we could make the farmers confident in the commercial production of white pepper. Now the entire white pepper produced by our certified farmers are procured by us at a premium price. Sliced Ginger: Drying of ginger was always a problem for the farmers as it required removal of the skin. This required so much of labour and drying required many days. But when PDS started the purchase of fresh ginger for making sliced ginger it became easy for them. The demand for ginger is on an increase which made farmers to cultivate more ginger. In 2002 the Organic Agri-Products & Exports Division began construction of its own processing facility at Valanjanganam, near Kuttikkanam. It was completed in 2005. The office was shifted from the small space at Pothupara camp office to the new facility and the name was changed to “PDS Organic Spices”. Similarly processing was carries out in the new facility from March 2005 onwards. Today PDS Organic Spices is the Topmost Exporter of Organic Spices from India. It exports certified organic spices to countries like USA, Japan, Germany, U.K, The Netherlands, France, Belgium, Australia, Korea, Egypt, Srilanka, Austria etc. The processing of organic spices from its own facility began in March 2005. The unit is fully dedicated to processing of organic spices and has a capacity to process 1 MT pepper an hour. It has a well-equipped in house quality assurance laboratory to ensure the quality of products arrived and dispatched. 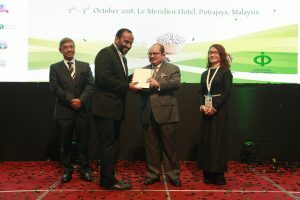 PDS Organic Spices won award from spice board for the “Top most exporter of organic spices from India” for the years 2002-03,2003-04,-2005-06 &2007 -08. Vetiver Micro-Enterprise has been promoted through the project to build the entrepreneurial skills of the farming women and to diversify the income sources of spice farming families. The farmers have taken up spice farming as their main livelihood and major part of their income is from sale of spices. The women from the spice farming families look after their household and support their men folk in farming as also through supplementing family labour. The women are financially dependent on men. As part of PDS interventions on these farming communities, discussions and meetings conducted with various groups to identify their needs. During one such meeting, the women from Murinjapuzha area expressed that they would like to start income generating activities to utilize their free time and make money. 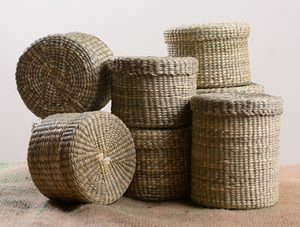 ‘Developing a locally grown green and sustainable packaging material sourced from the farming community for the marketing of spices’ is identified as a means to empower the small and marginal farming families engaged in the cultivation of organic spices to earn a better livelihood. The spices are grown in hilly terrains with high slopes. Soil erosion and resultant acidity is the major problem faced by the spice farmers. Vetiver is a tropical grass that grows in South India and its roots are well known for binding the soil. Vetiver has been introduced to counter soil erosion. The leaves of vetiver grow profusely but are left unutilized. 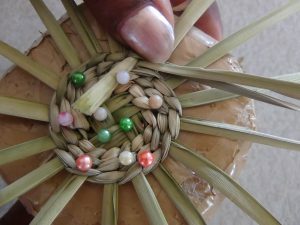 Using the vetiver leaves to make baskets for packaging the spices is considered. The farmer women have been identified and trained to produce vetiver handicrafts to create an additional source of income. PDS invited some expert Trainers from Thailand and they taught weaving techniques to 20 women during January 2012 through a seven days training programme. Follow-up trainings were conducted for one year regularly and the women were supported to improve their weaving skills. 3 women take lead roles of unit co-ordinator, training coordinator and quality control. Vetiver slips were distributed to farmers to grow it along the slopes of their land to counter soil erosion. The women group has entered into social contract with farmers to grow and supply vetiver leaves. Exposure visit to a women handicraft unit making screw pine baskets was arranged during 2012. 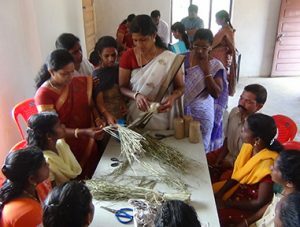 The women have identified 52 new women from 3 villages and trained them in making vetiver baskets. 10 such trainings have been conducted by vetiver group during April – August 2013. In consultation with Central Institute of Medicinal and Aromatic Plants (CIMAP) in Lucknow and Bangalore, new varieties that are suitable for making handicrafts are purchased and planted in PDS. A working capital is parked with PDS to be distributed to the Vetiver Group to manage the Vetiver Social Business independently.